Parking a tiny house in a city is a lot different than being tucked away (unseen) in a rural back yard. In a city, security needs to be taken just a bit more seriously. Now that I’m no longer there, I feel safe in saying that I hardly ever locked my door when I lived in Sebastopol, CA! Now, in Austin, I lock it every time I leave home. As part of getting settled in Austin, I’ve added several new security improvements to the tiny house — to prevent theft and to make both us and the house feel less vulnerable. Fumbling around with keys to lock and unlock to door multiple times a day is a pain. Keys get lost, they are hard to use in the dark, and (in our case) key holes can get dirty from travel, making it harder and harder to insert the key each time. Once in Austin, with constant use, it was time to upgrade our door lock(s)! I have a door with two holes (separate handle and deadbolt), so I decided on a Schlage keyless deadbolt in combination with a new, commercial-grade entry handle. 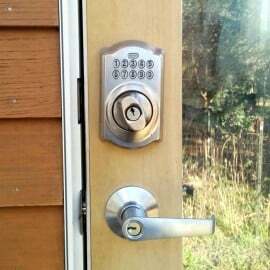 We now have two new locks, but on a daily basis, just use the keyless deadbolt when we leave the house and at night. After just a short time, I can already say that the ease of use makes this keyless deadbolt worth every penny. 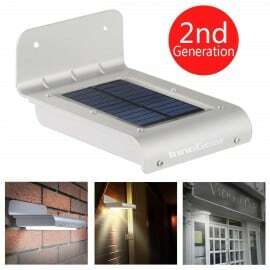 It’s very easy to install and use, and the keypad lights up for use at night. Coming and going has never been easier! With the recent news of a few tiny houses being stolen, I figured it was worth the money for a heavy duty trailer hitch coupler lock. The MegaHitch Coupler Vault is by far the more secure version of this type of lock, unable to be cut by bolt cutters like some of the cheaper alternatives would be. This lock is basically a large steel box, with no weak points to cut. I think it would deter or prevent all but the most motivated of thieves. By preventing someone from hitching the tiny house trailer to their truck, it effectively stops the theft of the house itself. I think as an insurance policy, it’s well worth the somewhat expensive $120 price tag. 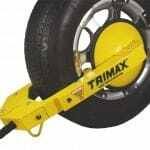 Another tool (but even more expensive) for of theft prevention is a wheel lock like the Ultra-Max Adjustable Wheel Lock, which is like a boot that gets put on your car, preventing the wheels from moving if someone tried to tow the house away. My house has an outswing door. From a security standpoint, this isn’t ideal because it means the hinges are on the outside. Standard door hinges have a removable pin. If someone really wanted to, they could pound that pin out of place, pulling apart the hinges, now able to simply remove the door from its frame. That would not be cool. Time for an upgrade! 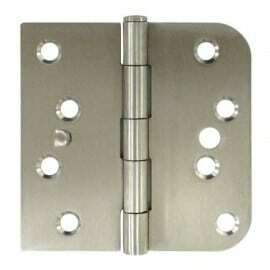 The solution is to get security tab hinges (stainless steel for weather protection). These look almost identical to normal hinges, but they have an added tab that when the door is closed, prevents the two parts of the hinges from sliding apart. This means if someone managed to take out the hinge pins, they still could not remove the door from its frame. I did not include wiring (and would not want to use more power) for outdoor lights to remain on all night. But having some motion activated outdoor lights are a great way to prevent people from snooping around after dark. My solution was to mount some waterproof, solar powered LED lights to each corner of the house. These lights include a small solar panel and battery as part of each unit, storing power during the sunny hours to later use at night. They require no power to run, so are perfect for those who are on solar power or are more conscious of their power use. These lights are great in that they turn on and stay on at a very low output level when it get’s dark and then have a motion sensor that when activated brightens the light to full output. When on low, they still light the way and make it easy to find the door, then as you get closer they come and really light the area well. After a few weeks of use, I do notice that the solar power reserves do not last all night. Now that it’s winter, with much fewer hours of light, they have less time to charge and are needed for many more hours. In the summer, with more recharge time and less use, I think they will last all night, but right now they do not. What do you do for tiny house security? Depending on where you live, locks, lights and anti-theft devices are probably a worthwhile investment to make you and your tiny house more safe and secure. Interesting article. I see the only useful upgrades being a hitch vault, boot, and hinges. I work in remodeling construction. We install windows, doors, etc. It’s been a real eye opener to observe the process and what people think will make them safe. If a house is built with hammers and saws, why do people think it would take something more to deconstruct it? 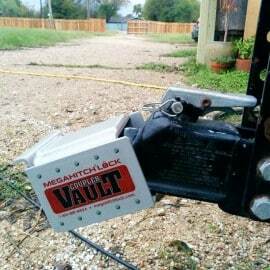 What size mega hitch coupler vault did you get? I’m purchasing one, and it looks like you got the 2inch trailer hitch lock for $120! Hi Sarah – I don’t remember the size I got. It’s based on the size of your ball mount. I think it might be more than 2″ for a class-V, so check your ball size first to be sure.